The Hav-A-Tampa brand has been creating quality premium tobacco products for decades. Their Hav-A-Tampa Filtered Cigars are examples of how well constructed and consistent their smokes are produced and enjoyed by loyal fans worldwide. Each of these discount filtered cigars are packed full of special blends of premium tobaccos that have been infused with unique flavors that bring a natural or sweet style taste that’s mild and aromatic. Switching to Hav-A-Tampa Filtered Cigars is a great way to save money in an over-priced world. Try a carton today! If you’re looking for a great way to save money over expensive retail brands. 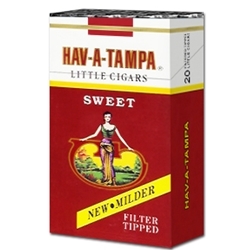 Hav-A-Tampa Filtered Cigars offers an excellent choice for your smoking needs. Smokers Discounts has made it easy and affordable to buy filtered cigars online. Call us for more details!